Whole Foods is having a one day sale on organic whole chicken! 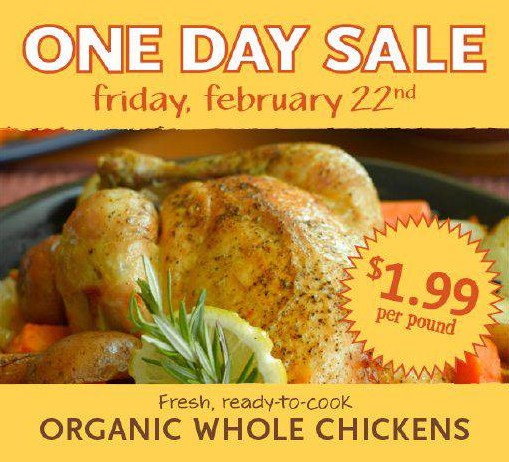 The chicken will be $1.99 lb this Friday, 2/22, only. This is the lowest price we see organic whole chicken at and it hasn’t been this price in a while. Availability and limits will vary based on region, so you will need to call or visit your store for their policy. The chicken is normally $4.69 lb, so this is a great deal. If you want to get ready for a shopping trip you can see the full Whole Foods ad here. You can see a full price comparison of organic chicken here.